How do I create a System Backup in SQL-RD? Need to create an ad-hoc backup of the SQL-RD system database and files? This is how to do it. Select the folder where the backup will be stored and click OK.
SQL-RD will now backup the necessary data files. You can schedule backups to happen at frequent intervals automatically. 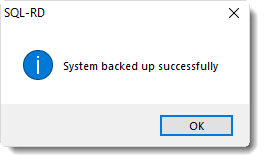 To do this, go to Scheduled Backup.